Mukt Residency is a residential development. This is an ongoing project. It has a thoughtful design and is being developed with all the modern day amenities as well as basic facilities. The project offers 2 and 3 BHK apartments and penthouses. Where is Mukt Residency located? Manjalpur, a prime residential locality for house seekers in Vadodara. What size of flats are available in Mukt Residency? 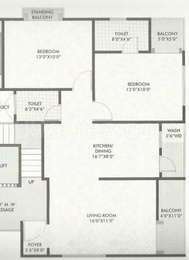 The apartment sizes in the project vary from 549.0 sqft to 1190.0 sqft. What is total area of 2 bhk in Mukt Residency? The area of 2BHK units in the project varies from 549.0 sqft to 871.0 sqft. What is the 3 bedroom size in Mukt Residency? The area of 3BHK units in the project is 1190.0 sqft. Does Mukt Residency have lawn tennis? The project doesn't have lawn tennis. Is there a basket ball court in Mukt Residency? The project doesn't have a basket ball court. i am interested in buying a property in Manjalpur area.And planning to visit in few days.